Love the different shades of red. FAbulous. Love how you colored some in darker. The red background is just beautiful and makes it pop! Thanks for sharing! Love the red BG and as you said, Valentine perfect. Wow...this is just to darn cute! I love how you added some depth with the Copic coloring! That background just pops! Awesome card, I love that you coloured parts of the background to alter the hues. This beaver is the cutest. That tone on tone color. Amazing. But that Beaver. Just can't, too adorable. At first glance, I thought you had made your background with the new Hexagon stencil. I love the texture that the cover plate adds instead. The tone on tone really adds a lot to this card! Great job! Love the bold red background and the wood is colored fabulously! Perfect card design! Love the different tone on tone of reds. The beaver is adorable!! Beautiful card!! I feel with the copic marker it looks velvety. I want to feel your card haha. 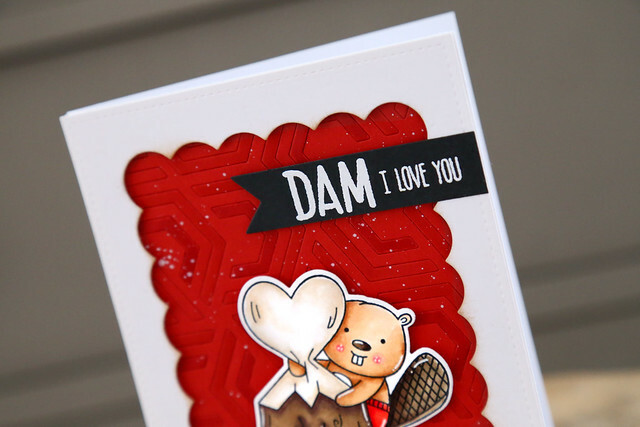 Love your tone on tone background!Awesome card! This would be a great Valentines Day card. The beaver is so cute, eh? I like how you added just a little bit of interest to be hexagon background by coloring using markers. 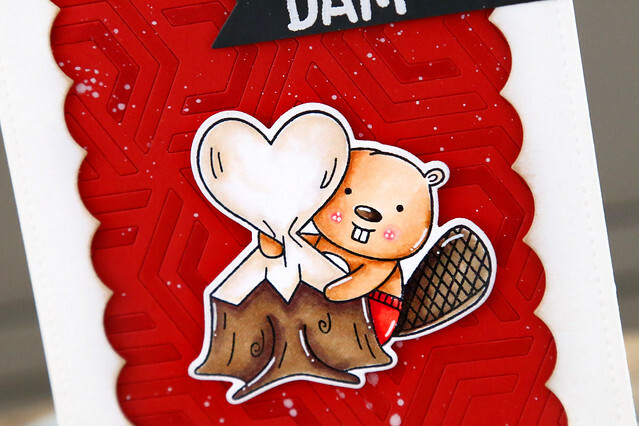 Your beavers in your set are just adorable -every single one! Oh, this is just brilliant!! What a great way to use the die! And you're right, this is so Valentine-y perfect! How cool, to add the pieces back in. I like the DEEP red, and of course the little guy.. Very cool!! What a fabulous way to add some subtle texture (and not waste any of those little cut out pieces)! Awesome background and love the cute stamps! That beaver is so adorable ! Love how you did the background! So Sweet! Perfect red for Valentine's Day, thank you! Super cute and that red background is incredible! 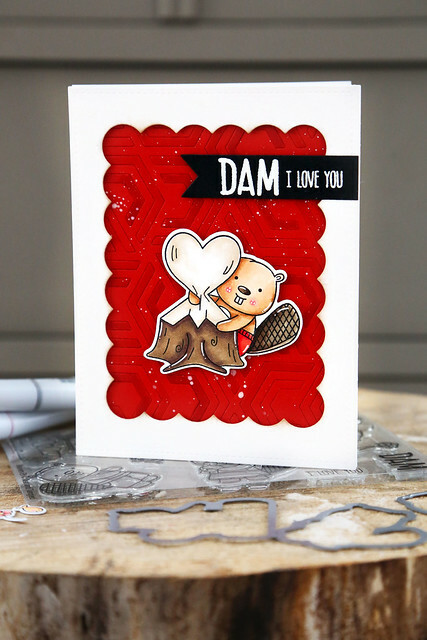 Cute card - love all that red color. Lovely card! The beaver on the red background pops out so well! Love that shade of red. The heart tree stump is my favorite stamp from this set. Love what you did with the background. Total card A+! !